Top 15 musicians from different genres are coming together at BEFFTA THIS IS LOVE charity concert to raise much needed funds for the Stephen Lawrence Centre in order to help keep it open. The fantastic line up of stars include Soul legend Omar, singer/songwriter Don E, pop sensation of the famous band Five Star – Stedman Pearson, soulful singer Dionne Reid, RnB singer Myco Chris, Jazz sensation/soul singer Anthony everest with his full band Aremuorin. Urban singer/songwriter and choreographer J-SoL will be performing with his full band. The audience at the concert will also be treated to the amazing sounds of the fantastic Afro-beats star May 7ven, and pop singer Racel Matthews and Sara Lili. Reggae artist Dego Ranks who has recently come from a tour in The Gambia , Africa is preparing to perform his best tracks too. Hiphop artist Cloud Silver Line will also be perfomring live with his band. Some people have called him the male Adele, singer David O has a voice to envy. He will be performing live with his band at BEFFTA THIS IS LOVE concert. Pop sensation Aisling O’Reilly who is preparing to perform with The Wanted will also give her best performance. A spectacular dance act with brilliant choreography is expected to open the concert followed by a short movie screening. Among special guests on the night are CEO of The Stephen Lawrence Centre Paul Anderson-Walsh, Baroness Scotland, Lee Jasper and more. 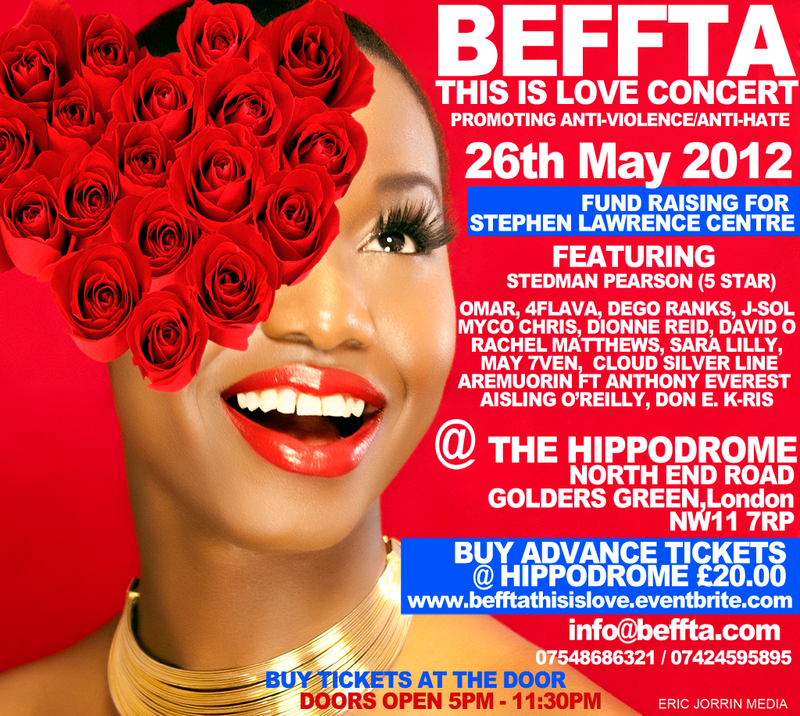 BEFFTA THIS IS LOVE concert taking place on 26th May at the prestigious Hippodrome in Golders Green and promoting anti-hate/anti-violence in UK has received great support from top stars including Wretch32, Wiley, Scorcher, Bashy and many more. BEFFTA team would like to thank top designers Linda Mirembe of LinmiR designs, Asake Oge of Asake Couture and Anrette Ngafor of KiRette couture, Afrocessories by J.M Prempeh for donating their designs to be auctioned to raise money for the Stephen Lawrence centre. 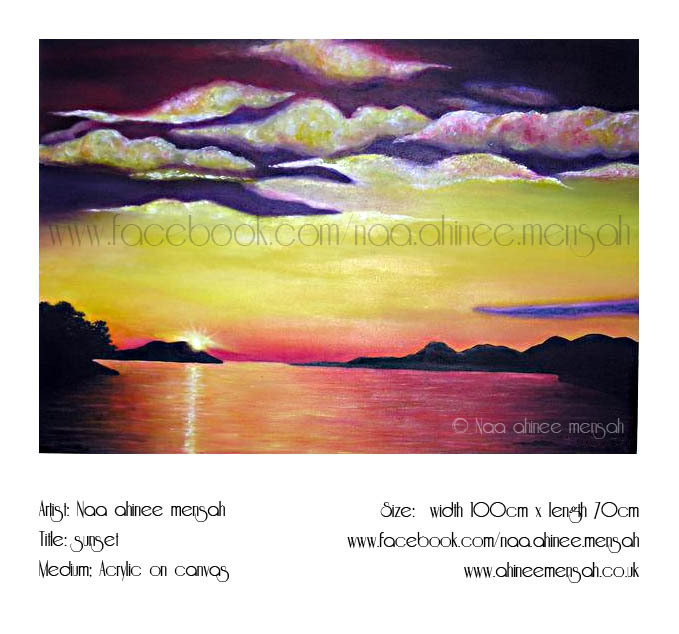 Aspecial painting by Tse Ataa Mensah foundation has also been donated for auction. 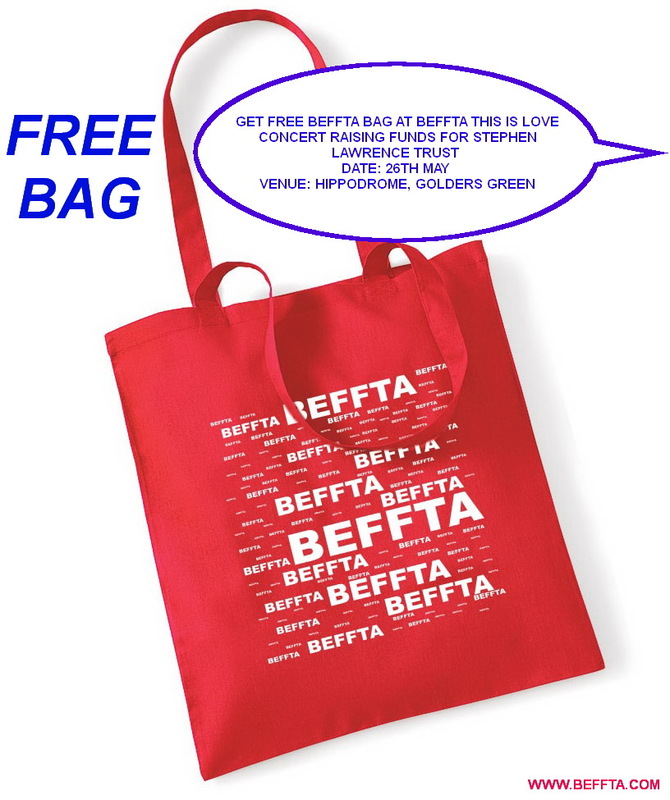 BEFFTA founder Pauline Long said, “BEFFTA THIS IS LOVE concert is about promoting love and campaigning for anti-hate/anti-violence. We encourage the community to come together and support community projects. The 1st annula BEFFTA THIS IS LOVE concert is proud to support The Stephen Lawrence centre by creating awareness and funds for it. We hope as many peple as possible will come out to support, we encourage people to get on our guest list free but donate from as little as one pound. Every penny counts”. The centre needs the community support in order to stay open.